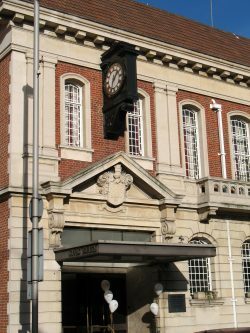 This well presented grade two-listed suite next to Wandsworth town hall is made up of two interconnecting functions rooms – the Civic Hall and Banquet Hall – both of which can be adapted to accommodate a range of events and celebrations such as: weddings, civil marriages, award ceremonies, dinner dances, conferences, examinations, funerals, open days, fashion shows, cultural events, theatre productions, christenings, film shoots, concerts and pantomimes. The Civic Suite has sprung maplewood flooring, wood-panelled walls. 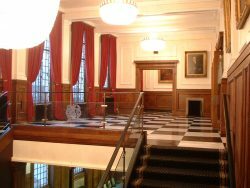 The foyer comprises marble fixtures and 1930s chandeliers, along with portraits of former local mayors on the walls leading up to the room, giving it an Old World ambiance. 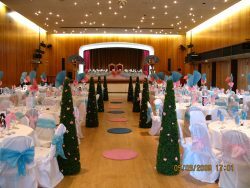 The function rooms are made up of the Civic Hall and Banquet Hall adjoining each other to make up one large space. 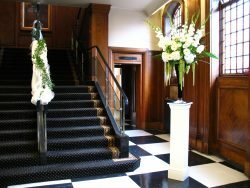 The Civic Suite is licenced for civil marriages and civil partnerships. The Civic Hall has a sprung maple wood floor and high suspended ceiling. 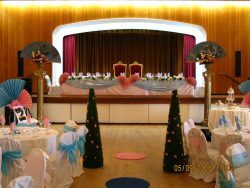 There is a raised stage with full length red velvet curtains and a small back stage area. 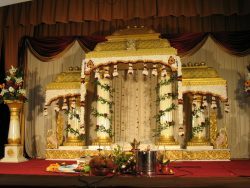 The Banquet Hall is equipped with a large commercial kitchen based at one end of the room. At the other end is the Twyford Room, which can be used as a bar or closed off to create a more private room with additional seating. 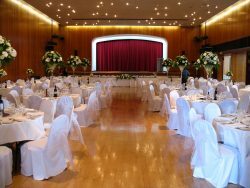 The Civic Suite is ideal for weddings, dinner dances, conferences, stage shows, exams, seminars, open days and for filming. Download our Civic Suite brochure for details about the venue.